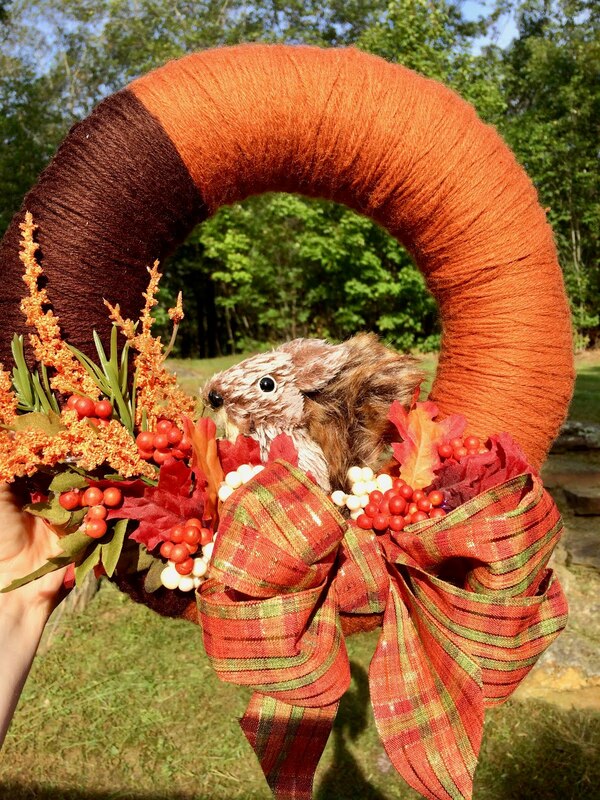 I saw a cute idea on Pinterest about making a yarn-wrapped turkey wreath. I went to the craft store with full intention of buying materials for said wreath. Then I saw this cute little squirrel just sitting there on the shelf. And....it was on sale. 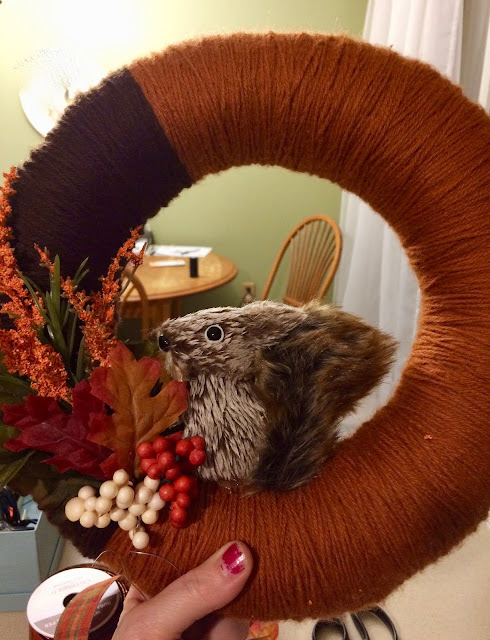 I had to change my wreath plans immediately! This wreath is quite simple to make. Basically you just wrap a straw wreath with yarn and glue stuff on it. Ha! Simple, right? Here are all my supplies. I was going to buy new yarn, but I remembered that I definitely had plenty lying around. The things I bought on this trip were the ribbon (40% off baby! ), the squirrel (on sale), the wreath (not on sale) and flowers (50% off!!). Still, this wreath cost around $10-12 to make. I've seen people wrap pool noodles, which would be cheaper, but I wasn't up for the challenge. As you can see, I left the plastic wrap on the wreath. 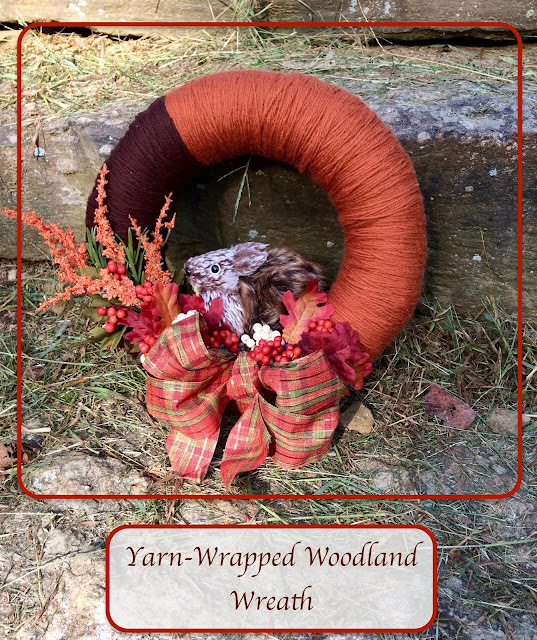 Years ago when I made yarn-wrapped wreaths I read this tip. It helps you to not get straw everywhere and I definitely recommend it. To begin, wrap the yarn, tie it to the wreath, knot it and tape it down. Then wrap, wrap wrap. It's a little tedious, but it's a great TV activity. Above you see the wreath almost done, but in the hot-glue process. Basically I just glued things where I thought they would look good and finished it off with a bow. Wreaths are a very easy way to get creative. Just start with the basic process and embellish in your own unique way! You can see I added a bow, but you won't need one if you like things simpler. It's up to you! Do not unwrap wreath. If wreath is already unwrapped, you may cover it in plastic wrap. 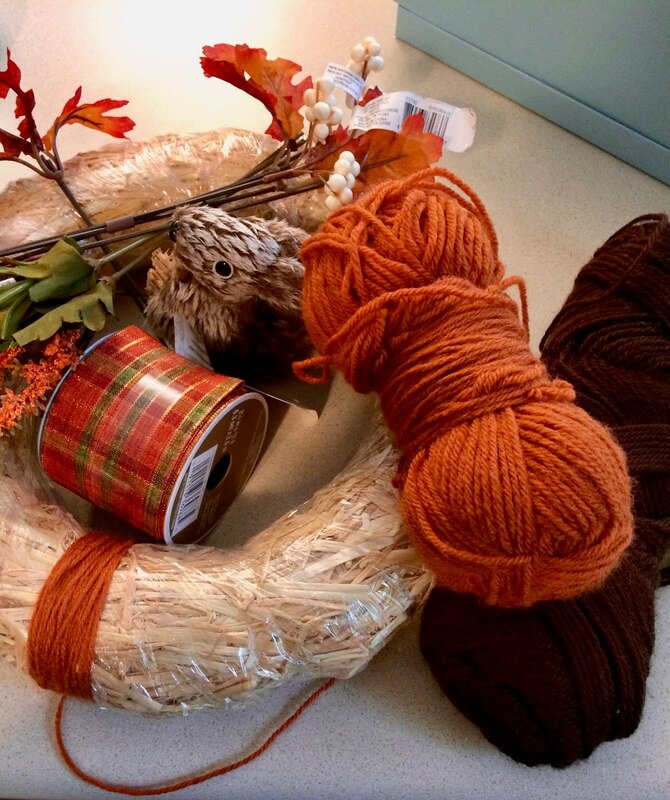 Tie orange yarn around wreath. Knot and tape down with tape of your choosing. Wrap yarn around wreath being carful not to leave any straw showing. 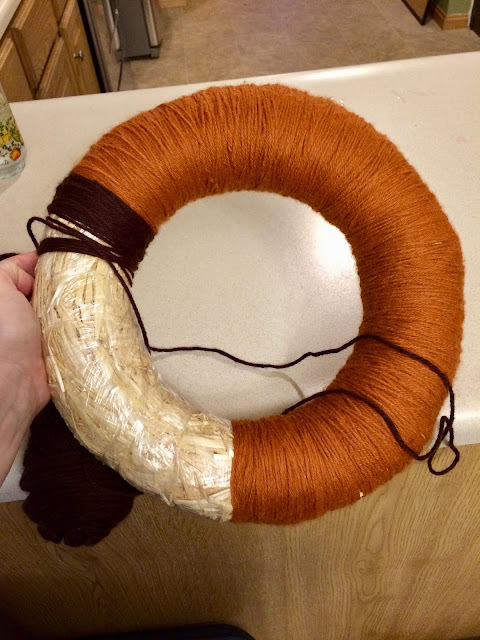 Continue until wreath is about 3/4 covered in orange yarn. Tie off orange yarn and tape down. Tie on brown yarn and repeat steps above. Tie off brown yarn and tuck in yarn tail. Hot glue on squirrel and flowers, being careful to hide your glue. You don't want it showing all over the place! After everything is glued on, trim any glue strings. Tie a bow with your ribbon. Place wire through bow and secure to wreath. There you have it, done! I used a command hook to attach my wreath to the door. I simply hooked it right through the wreath, no special hangers to attach to the wreath are necessary. As a reminder, I'm participating in the Ultimate Blog Challenge. Click the link to the Facebook page and see what the fun is all about! This is adorable and I could see my Step Daughter making one and yes, she is using Pool Noodles and outside bulbs to make her great grandmother a wreath to take to the Cemetery. As for me I have no, creative bone in my body so will leave this to her. I'd love to know how the pool noodle version comes out. All I could imagine was it popping open. I think this is something my ex-girlfriend would love. (She rotates her wreaths at least a dozen times a year...) I'll let you know if she bites at it. Love the colours by the way! Thank you. Your comment means a lot :) Maybe you can use up some of your stash making a wreath too!